Whew, the past few weeks have been crazy. I have about five posts in my head (and in pictures) that haven't yet made it to my fingers and keyboard. And this week I'll be teaching Camp Runway (oh, I can't wait!) so those posts don't stand a chance of escaping from my head. I'm sure they are feeling cooped up and a little stir crazy (wouldn't you if you were stuck in my head? Shudder.) but they'll just have to stay put. 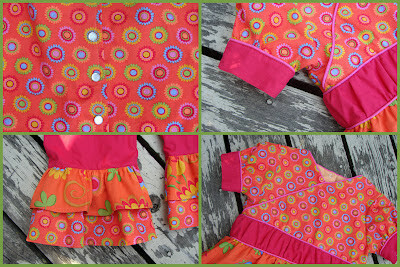 I've been sewing some little clothes for little people in the past few weeks. 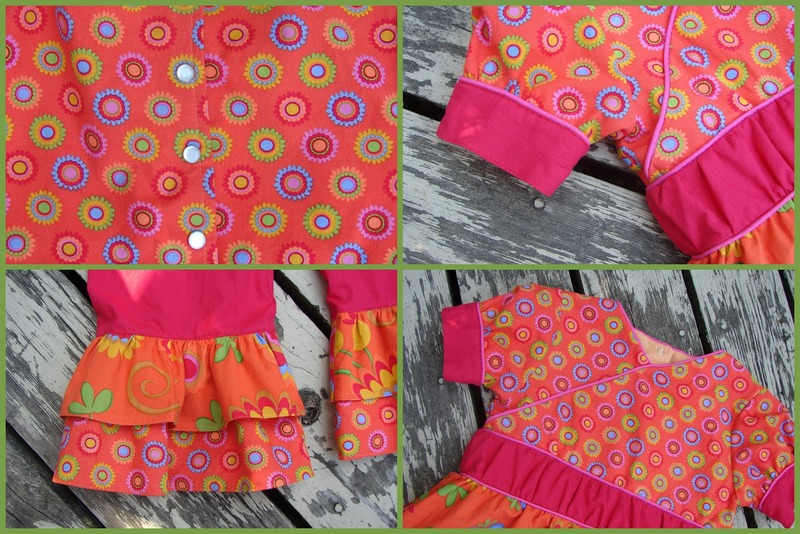 This first outfit is for Helen, the daughter of one of my clients. She really liked the idea of these ruffle pants and from there we figured out an idea for a top to go with it. I had fun with the process on this one. Helen and Melissa came over to look through my fabric stash and Helen loved the Michael Miller Pretty Birds Dancing fabric (orange). I put together a board on Pinterest with other possible fabrics and an idea for the top. She picked out her favorites and I ran with it. Or rather, clumsily shuffled through it. The pattern I found to use as a starting point for the top (Peek-A-Boo Pattern's Charlotte Dress) was much more difficult than I imagined. I think some of the difficulty was due to some awkward construction issues - I'll be tweaking these in the future - and I had to re-do a few things to get it right. I think the top alone took me close to nine hours to complete, which seems just plain silly. I do like the design, so I'll likely make it again, but faster. I also made some little clothes for my own kids (WHAT? MAKING CLOTHES FOR MY OWN FAMILY?? SHOCKING!!). I usually do this only for special occasions as they really have way too many clothes already. But with Thing 1's 5th birthday, I really needed to create something special. I bought the main fabric from a woman here in Berwyn who was clearing out her stash (she used to run a business sewing kid's clothes and baby blankets). It's an old Michael Miller design, and I was kind of surprised that my big girl fell for this one. She picked out the contrast fabric at Joann's and the buttons were from Grandma's basement. The pattern is the Addison Dress from modkid patterns. And because I had fabric left over, I had to make Thing 2 something to match . .. So glad we were able to find a coordinating piñata! My MIL gave me a book on decorating cupcakes a few years ago and the tradition we have is that the girls get to flip through the pages and pick out their design. And since this birthday girl's favorite food is apples, she wanted these (stems are tootsie rolls, leaves are rolled out starburst). I have to say I'm pleased she managed to thwart the Hawaiian theme. And I've got some big breaking news (not sure why I'm burying here at the bottom, but there you go - maybe it's the teacher in me making sure you read to the very end). I'm finally making enough money between teaching and sewing custom-made clothing and bags to afford a day or two of childcare for the little one now that the big one is in school. I'm excited to see where I can take things with daytime consecutive hours in which to work. Wish me luck! 4 comments on "Little Clothes"
They are so lovely :) All the three are sooo cute. My favourite has gottu be the second one. Good luck! That's exciting news. And very cute outfits! Thanks, Ladies! I feel like I'm at the start of a new adventure!